On An Overgrown Path: Whatever happened to the HPSCHD? Whatever happened to the HPSCHD? Definitely something not to be missed. Although at a UK retail price of around £20 for 2 CDs of an amateur mono recording that is more than half-a-century old, hardly a bargain. 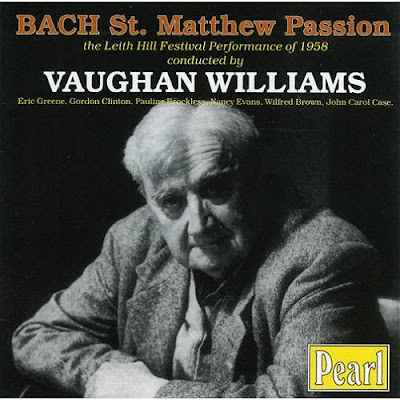 Vaughan Williams' 1958 performance of the St. Matthew Passion cuts twelve numbers including four arias, is sung in English with a large chorus, and uses a piano and organ instead of harpsichord for the keyboard continuo. 'It is our privilege and duty to use all the improved mechanism invented by our instrument-makers to do full justice to this immortal work' - Vaughan Williams explained. It would be difficult to find two greater musical opposites than Vaughan Williams and John Cage. But they do have something in common. Cage said 'I hate the harpsichord, it reminds me of a sewing machine'. Despite that Cage went on to compose HPSCHD for up to 7 harpsichords and 51 electronic tapes. Memories from John Cage's HPSCHD supplier here. VW's Matthew Passion was recorded in the Dorking Halls. Personal memories of Dorking here. Pliable, thanks for all your wonderful posts. However, I recall my old Nonesuch LP recording of HPSCHD fairly explicitly giving both John Cage and Lejaren Hiller as the composers of the work. Here is an interesting link to Lejaren Hiller, although it doesn't cite the work in question. Garth, you, as usual, make a very good point. That being said, the VW performance of the St. Matthew is quite wonderful.